A 'who's who' list of Erie's musicians took the stage at The i April 17 to help raise money for one of their own. On October 8, 2010 local musician Rodger Montgomery was installing a new garage door. While working, Montgomery saw a Pennsylvania State Police helicopter begin circling his property. Seconds later three police cruisers pulled into his driveway and the police copter swooped in. After officers identified themselves and asked Montgomery a series of questions, they searched the property. They found marijuana growing. Police found only a handful of plants on Rodger's property—all intended for personal use, according to Montgomery. But regardless of intended use, in the state of Pennsylvania Montgomery's charges bring fairly hefty consequences. The cultivation, delivery, or sale of 1,000 pounds or less of marijuana can be met with a fine of up to $15,000 and up to five years in prison. While sentences can vary, Pennsylvania is a mandatory minimum state. This means Rodger could be looking at a minimum of one year in jail plus a $5,000 fine. While growing marijuana on his property was a risk Roger took, his recent run in with the law has added water to an already sinking ship. 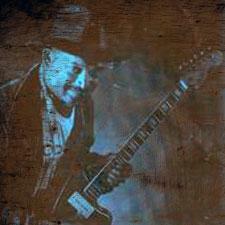 Rodger Montgomery has been one of the region's top blues men for nearly three decades. He's rocked just about every club in the region and his name is synonymous with good times. His performances at both the old and current Docksider are legendary, and his open blues jams are a place for local up-and-coming talent to go and show off their chops before the master. But Roger's recent run in with the law looks like it will change his life forever. Close friend and fellow blues man Ron Yaroz explained the added complication the bust brings: "Aside from this current problem, in February 2009 he was in the hospital for a hernia surgery that ended up costing him over $30,000. He has no insurance, but can pay that one a little bit a month, but the legal defense doesn't take payments. He needs the help now." Realizing this, Rodger swallowed his pride and asked for help. Rodger approached Marty Schwab, owner of downtown Erie jukejoint The crooked i, with the idea of a mega benefit to help raise money for his legal fees. And with that The Royal Blues Benefit was born. The benefit, which took place April 17, was an assemblage of Erie's finest musical talent all hoping to raise enough money so that Rodger can hire an attorney to help fight his legal battle. The list of supporters who performed in front of a packed house at The i read like a 'who's who' of the Erie music scene. Bands such as Ron Yaroz and The Vehicle, Is What It Is, Eric Brewer & Friends, Matty B and The Dirty Pickles, Shotgun Jubilee, Breeze Band, Pickup Band, Matt Texter, and Jack Adams put everything aside in order to help out. Even Roger took the stage. As local guitar phenom Eric Brewer put it: "We, collectively as musicians, have all done countless benefit shows for others from all walks of life. This one is no different. It's not pro-weed or anti-weed; it's pro-Rodger. Politics go right out the window." Yet the politics are still there. The idea of a benefit of this kind could be frowned upon by supporters of the anti-drug movement, and participating in it seems to make it fairly clear what your views on the subject are. But that hasn't seemed to deter anyone. In fact, it's as if a statement is being made. "Marijuana laws need to be seriously reevaluated by the state of Pennsylvania and our country as a whole. I feel that tax dollars could be put to better use, to combat more dangerous drugs than marijuana," Schwab said. "Our country is currently in financial crisis. Legalization could possibly help get things back on track, at least financially." The crooked i went as far as to invite the Pittsburgh chapter of NORML (National Organization for the Reform of Marijuana Laws) to be a part of the event. They handed out information on marijuana legalization and addressed the crowd from the stage between bands. Many of the bands feel the same way Schwab does. "I understand that what he did is illegal as far as the law goes, but he had just a handful of plants growing on his own property for his own personal use," Yaroz said. "We can debate the legalization laws like so many have before, but all I can say is that if this happened in some other states he wouldn't need a benefit because the laws are more tolerant there." Yaroz has a point. For instance, in parts of California marijuana has been made legal for medical purposes. One only needs to obtain a prescription for the drug. Still in many other cities, while marijuana remains illegal, it has been quite decriminalized. States as close as Ohio and New York treat personal use of marijuana much like a traffic violation. If a person were caught with less than 30 grams of marijuana they would be subject to a $100-$150 fine. Here in Pennsylvania, 30 grams or less will get you up to 30 days in jail, a $500 fine, and possible probation. It's up to you to decide where you stand on the subject of marijuana. For the supporters and participants of The Royal Blues Benefit, it seems many of them have made their decision and chose to stand by it. "I want to thank everyone from the bottom of my heart for their support," Montgomery said. "It isn't easy, but I think we all should stand up for what we believe in. Martin Luther King Jr. did it, Malcolm X did it, and Bob Marley did it. Now I am doing it!"